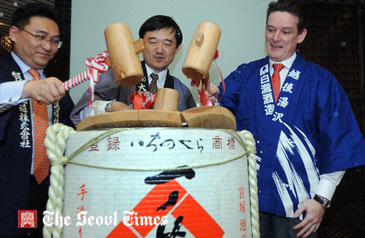 General Manager Jerome Stubert participate in the opening ceremony of Sake Room at Novotel Gangnam SH. The Japanese Super Dining Restaurant ‘SHUNMI’ at Novotel Ambassador Gangnam celebrates the opening of its new “Sake Room” with a special event of ‘Gagamibiraki’ on Sake Matsuri (Festival) Day’, March 24. ’Gagamibiraki’ is a Japanese ritual event for celebration by opening the liquor jar. Mr. Endo Saposi, the head of Nigata city’s Seoul office and General Manager, Mr. Jerome Stubert, in traditional Japanese costume, led the event by opening the jar and served one glass of complimentary Sake for all SHUNMI guests. SHUNMI, with its newly opened Sake Room, features a special celebration event by offering a 50% discount on the promotion menus on Matsuri (Festival) Day, every 4th, 14th and 24th. The event is available through end of June and offers a ‘Nigata Sake Set Menu’ at 75,000 won.